This building was also built by the Dice brothers, this brick structure was completed in 1912. 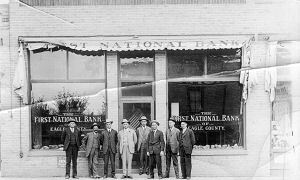 The First National Bank of Eagle immediately moved to the single-story section of the building on the north.his building was also built by the Dice brothers, this brick structure was completed in 1912. 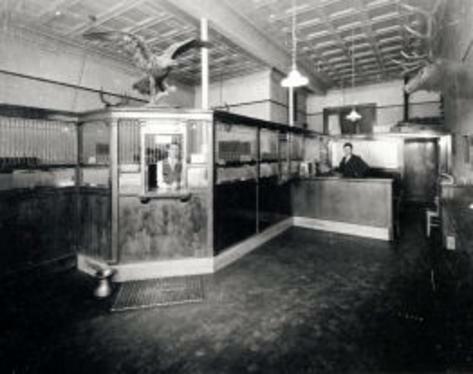 The First National Bank of Eagle immediately moved to the single-story section of the building on the north. 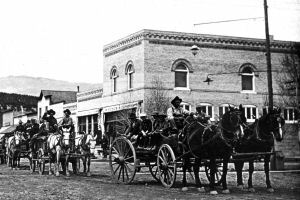 ​On the south side, the Hugus Mercantile Store, a general merchandise store, occupied the lower floor. The upstairs was used as a Masonic Hall. It also served as Eagle’s first movie theater. ​The two story south side of the building is best remembered as the location of the “H.W. Lewis Store.” Tom and Rose Lewis arrived in Eagle in 1915 to work in the Hugus Mercantile Store, which they eventually purchased. Over time their sons, Harry and John, took over the store operation. 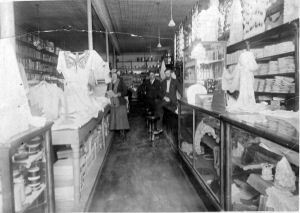 Eventually, Harry and his wife, Teresa, built the store into a well-known general merchandise business where customers could buy merchandise ranging from cowboy boots and Levi jeans to bananas, cans of corn and fresh-cut pork chops. The Lewis Store operated until December 1975 when the bank that owned the building expanded into the space. In recent times the upstairs has served as office space for various local businesses.